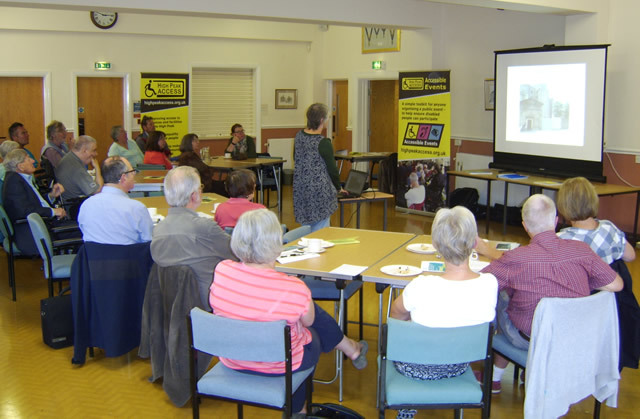 High Peak Access have hosted three recent events to highlight access difficulties faced by disabled people. Funded by the Bingham Trust, Red Nose Community Fund and NDVA, the events were in Buxton, New Mills and last one in Glossop (pictured). People could share first hand accounts of local access issues in each area and learn of those HPAG are involved in. Common problems included cars parking on pavements, access blocked by wheelie bins and narrow pavements in villages and towns. We also showcased our new web-based interactive app, "Organising Accessible Events”, which helps groups decide on suitable venues for meetings and events. This is available for use via our website. We were also able to highlight the role we have in influencing strategic planning policy, like the Local Plan produced by HPBC with its implications for the delivery of accessible housing in High Peak.